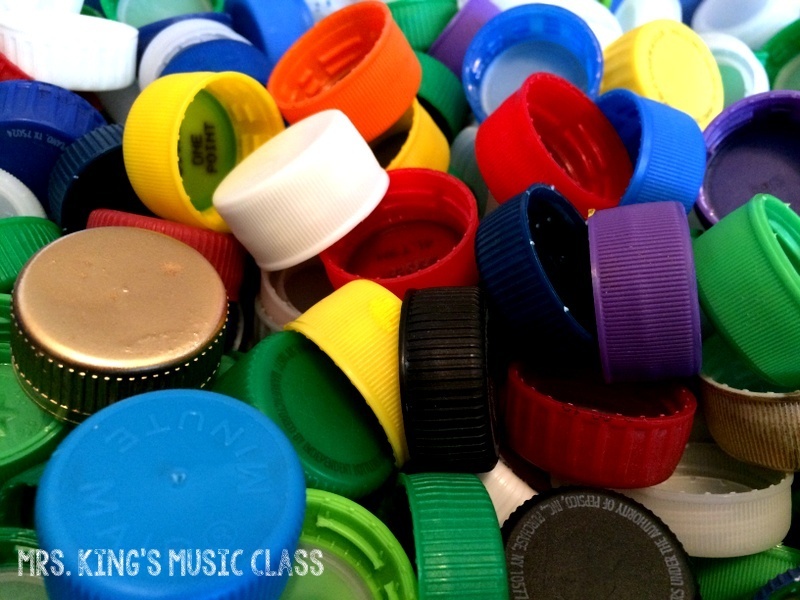 Let's face it, most music teachers spend hundreds (I've even heard thousands!) of their own money each year on resources for their classroom. It is one of the reasons that I am so glad that I found TeachersPayTeachers. I love the affordable resources that were created by teachers like me. I've compiled a list of some great freebies that I think you'll love in this post. I hope that you'll try them out and follow all of these amazing music educators there. You can follow them (and me!) by clicking the green star by the name of the store. When you do this you'll get occasional notifications via email when they add new resources. How did I live this long without knowing about the Big Apple? Your students will be just as delighted as I was! This PowerPoint file is linked to several amazing videos. You'll want to add this to your yearly lesson plans. I am such a fan of John Williams and so are students that are introduced to the magic of his music. This set of foldables is perfect for the classroom or private studio. With ample opportunities for research and writing, this freebie is great for cross curriculuar integration. I love, love LOVE David's amazing collections of folk songs. 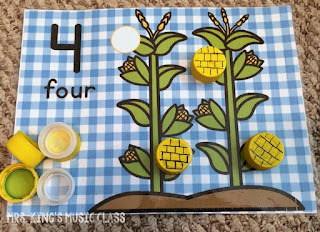 They make great bulletin boards and great tools for introducing songs. After using several of them, my students were more than disappointed to learn that our next song did not have the "cool slide show" to go with it. LOVE that! 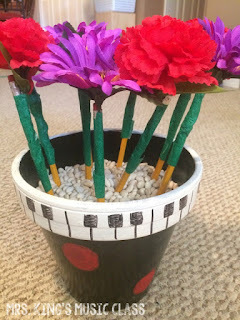 I love celebrating composers of the month with my students and I created this series of composer bulletin boards and writing activities to use. Since I used the kits for Kindergarten through 6th (and for a few years 7th and 8th grades), they were designed to used accordingly. Grab this one (normally $5.99) for free! 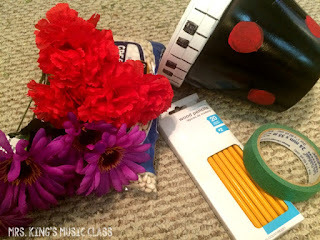 I'm always looking for ways for my youngest learners to write in music class that don't take up our entire time together. This book is my solution! We can do a page or two on an instrument that we are studying and continue to add to it as the year goes along OR I can leave it for a sub and they leave with a beautiful book to take home. So, a few years ago in the midst of 20 snow days at home, I ordered a ukulele. I did not do well. LOL. I think that Shelly may have convinced me to try again! This is a great way to get started with the uke. You'll probably want to check out her post about choosing a great instrument too. Learn about Linda's recorder program and get tons of music to use with your learners. She starts with C and A instead of the traditional BAG. This freebie is filled with many great ideas for teaching and organizing. I wish I had this twenty years ago! This is such a great idea! In this freebie your students are asked to listen to an unidentified instruments (sound files included) and then race to identify it by retrieving a card. FUN! Do you love the look of camo? You are going to love this set of Orff instrument labels! Make sure your instruments are decked out with these free printables. 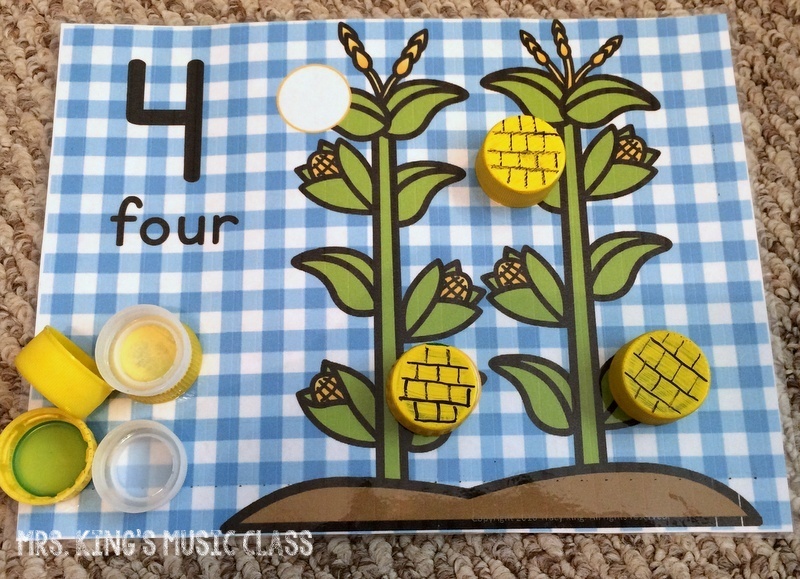 I am a BIG fan of centers in music class and this free download sets you up for four (Yes. I said FOUR!) recorder stations. It's easy. It takes little explanation. It's brilliant. Did you hear me? Go get it! I've said this for years and years "I knew how to teach music after graduating from college, but no one taught me what to do on that first day!" This detailed and engaging lesson plan does just that. 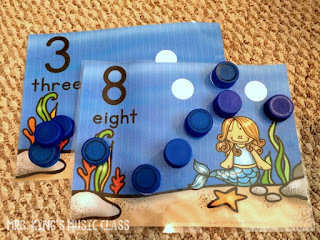 Songs and activities and a great sequence are laid out in detail. Try this freebie and you may want the entire year! The Adventures of Sophie Solfege - Sophie Climbs the Ladder by Angie Kelton of i heart teaching music. This is a clever (and quite adorable) way to introduce lines/spaces and solfege to your students. You are probably already acquainted with Sophie Solfege, but if not this is the place to start. This is a fun and engaging lesson for first grade! 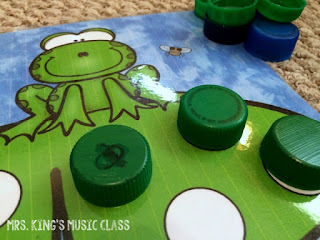 It is actually a sampler from a much larger work, but this is a stand alone lesson plan with great ideas, a detailed plan and several songs and activities. Warm up with these fall vocal explorations. These slides are laid out in beautiful autumnal colors and would be a great way to start class. Such a difficult skill, such a great freebie to help! 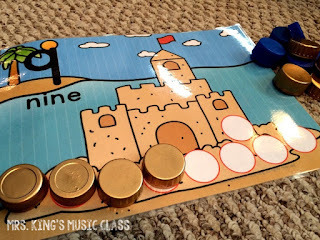 With these worksheets, students transpose sol and mi to different places on the staff! Although this is probably intended for younger students who have just learned sol and mi, I can see it being handy for older students too! 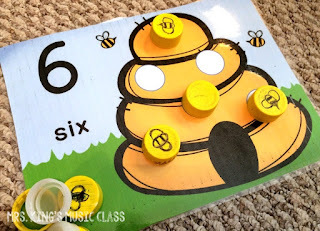 This catchy little round is laid out perfectly for your Kodaly classroom. You get the sheet music, solfege and pitch names version as well as a file to introduce it. WOW! This is a great set to use for vocal explorations at workstations (or as part of your Peter and the Wolf workstations). It's a great way to warm up a group before singing and it is a fun (and silly!) way to review the characters in PatW and the instrument that plays their theme. Okay I must admit that I haven't played this game with students yet, but I have about 20 different props for whacking! LOL. 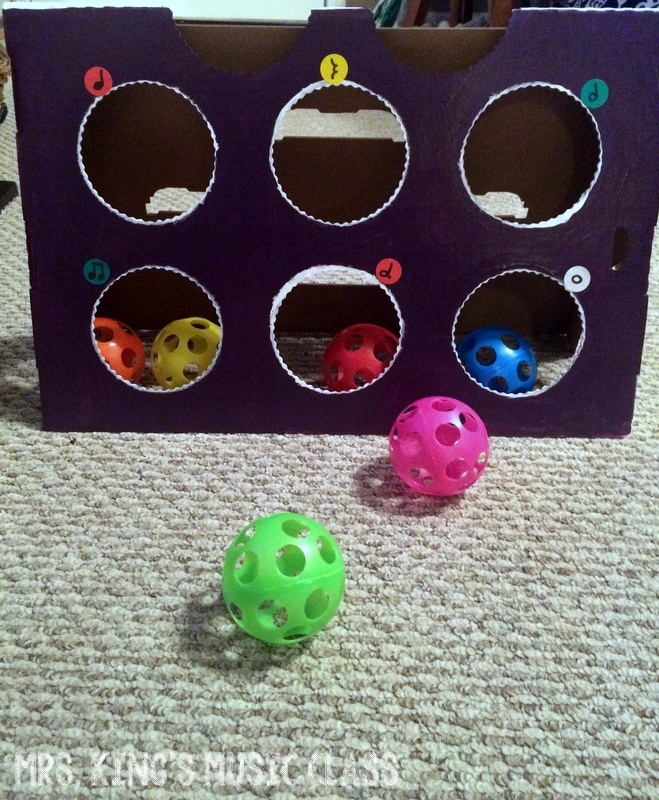 Cara has put together a simple, but ridiculously fun game that you'll want to download today. Working with ta and titi? You'll enjoy this bright and colorful download of "Engine Engine Number 9" that works on quarter notes and barred eighth notes. Working from lyrics, then steady beat and then rhythm, this is a great plan. I'm always looking for print and go worksheets to use with my students. 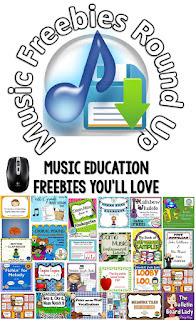 This sampler of 16th note worksheets is great! You'll get worksheets for "Dinah", "Old Brass Wagon" and one that works great for ear training. This has to be one of my primary students' favorite activities! 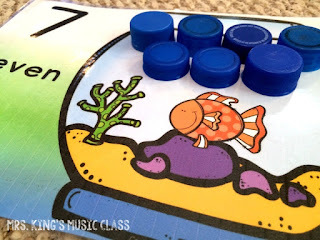 Students say (or rap) the pictures, clap them and them match them with rhythms. The worksheets make assessment a breeze! This is a freebie, but be sure to check out the entire line of Rap It, Clap Its in my store. What's a rhythm clap back? Well, you know. It's a rhythm that you clap back! 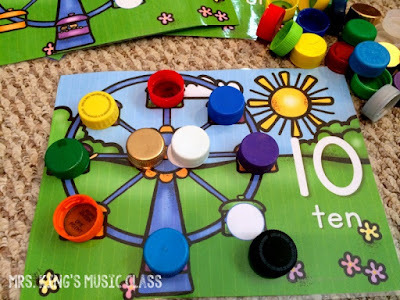 This freebie has 5 different rhythms represented iconically and a worksheet. Such a smart idea! 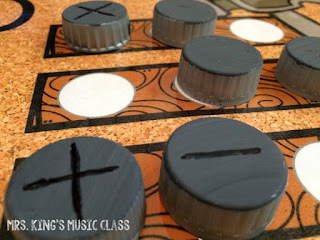 This game is essentially music dominoes and it's FREE! A great resource for music workstations or to use during a reward day, you'll want to print and laminate this one and use it for many years. Don't have time to grab all of these fabulous freebies now? PIN this list and grab them later! In twenty years of teaching I think that I must have tried twenty thousand different ways to protect my pencil stash. Once I even bought pencils that said "Stolen from Mrs. King". My high school kids took it as a challenge. I've never lost pencils faster than I did that year! I supply my own pencils because as a music specialist, it can sometimes be a hassle to have students bring a pencil to class. They forget or I forget to remind them. Sometimes when they remember they bring an entire pencil box full of everything but the kitchen sink. It is just easier for me to have my own stash. That being said, the pencils come out of my grocery budget so I always want to keep them as long as possible. One of the solutions I loved the most was to turn the pencils into classroom decorations. It isn't the perfect solution, but it might be the prettiest! 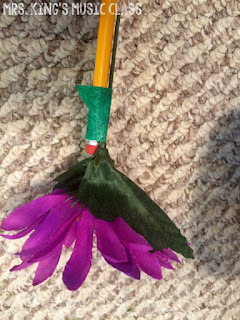 When turning the pencils into flowers you give up the ability to use the eraser. This actually works really well because the erasers usually only last about two weeks anyway. (If I am lucky!) I always have a small tub of erasers that students can use if they need them. 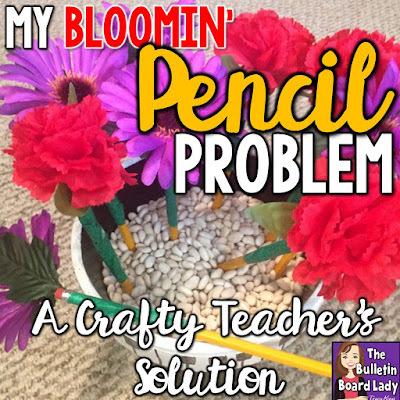 With the flower pot pencils, Once they are sharpened to the green, I retire them from the flower pot and put in a pencil can. 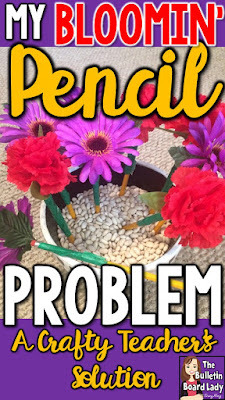 About mid-year (or whenever all my flowers have been used up) I'll whip out the can of used pencils that magically have FULL erasers! With this can of pencils and a hope and a prayer I can coast right into summer! So, let me introduce you to an old project to introduce you to my newest project. A few years ago I painted several flower pots with a keyboard theme. I stuffed them with flowers and put them on a shelf in the teacher corner of my classroom. They made me smile each time I saw them! After a couple of years, I decided to retire them. Now, they hold my bloomin' pencils. 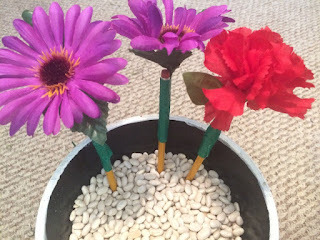 For this project, you'll need a flower pot (painted or not), some fake flowers a pack of dried beans, green masking tape or floral tape and pencils. The green floral tape works really well, but for this batch I only had green masking tape, so that is what I used. I snipped the individual flowers from the bundle and using the masking tape adhered them to the pencils. 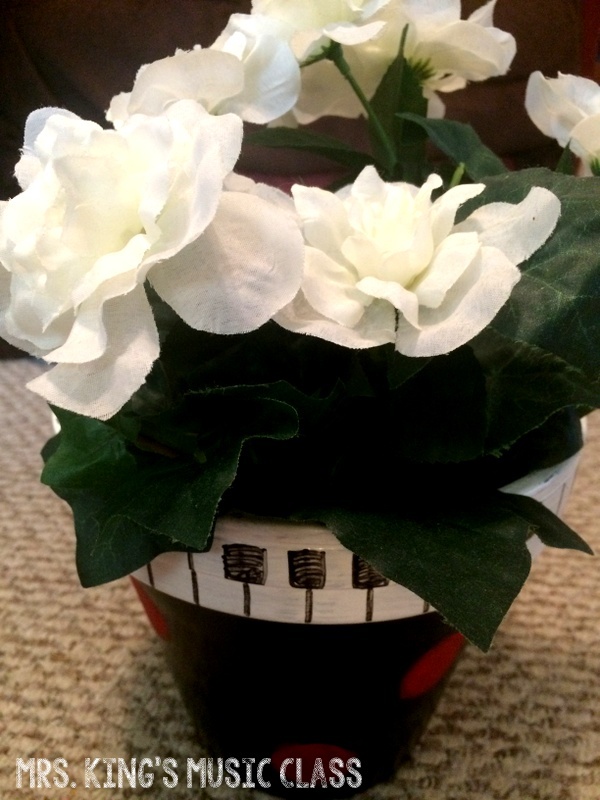 Put a couple of pieces of tape over the hole in the bottom of the flower pot and fill with dried beans. 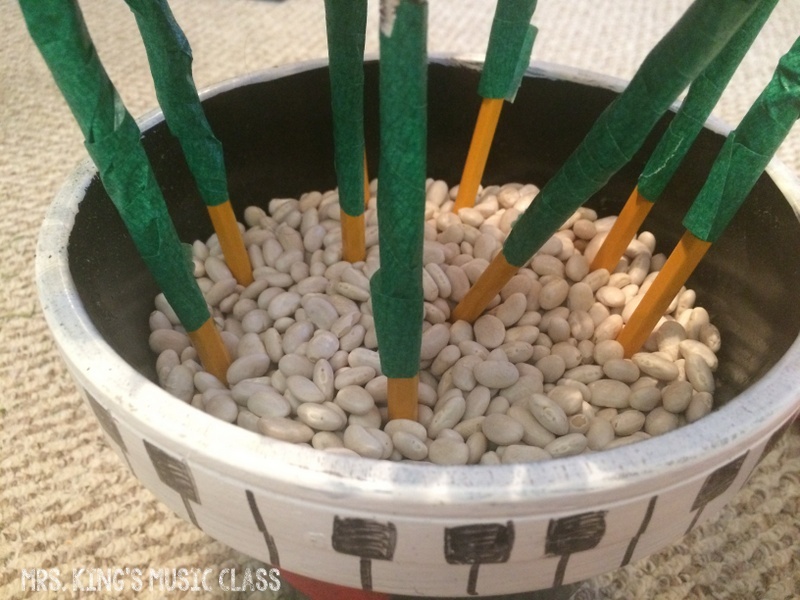 The beans hold the pencils up so that they look like a bouquet of flowers and they are gentle on the lead so that it doesn't break each time a pencil is replaced. If you look closely in the picture above, you'll notice that a few pieces of the masking tape are starting to curl up a bit. This happens with the floral tape too. I secure them with a piece of clear, Scotch tape and they stay put. This finished product is a bright and cheery addition to your classroom and a solution for your pencil problem! Eventually I moved the flower pots to several places around my classroom. This made it easier for students working at workstations to have supplies close to them. It also looked pretty! Welcome to a new segment on my blog. As a busy wife and mom, I've decided to share some stories from my crazy and wonderful home life. Crafting, recipes (that I don't ruin! ), parenting and loving the one you are with will all be features of MrsKing@Home. 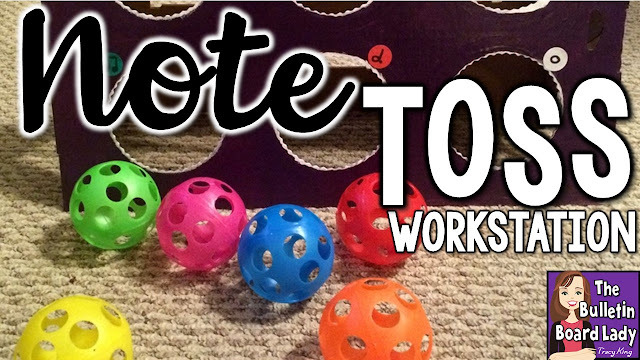 I'll also be sharing activities that I've created for my kids to further their education and some that are just for fun! Eventually, you'll be able to see all of these posts by clicking on Mrs. King @ Home right under the page header. My daughter, a bright and sassy 4 year old, lives in a world of princess, mermaids, rainbows and unicorns. With her rich imagination she is always playing pretend or performing for us in some dramatic fashion. Last week, I thought that we should spend a little time working on recognizing numbers. Unfortunately, she disagreed. "Noooo!" she whined. 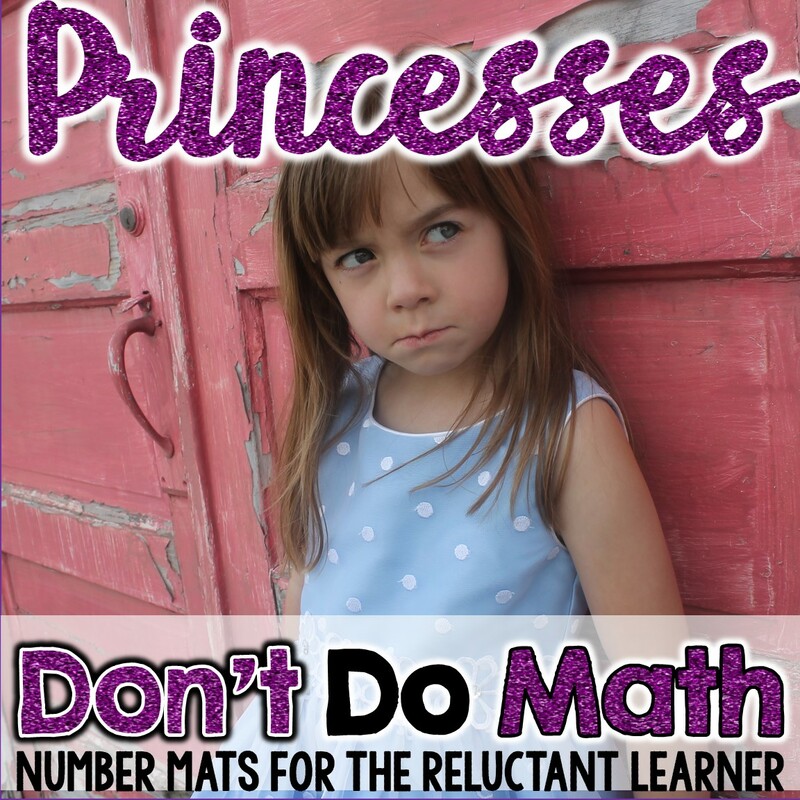 "Princesses don't do math!" When I stopped laughing, it occurred to me that I needed to make this time just a little more fun for both of us. Thus, the bottle cap number mats were born! If you are a regular reader of my blog, you know that I love recycling bottle caps to use in the classroom. I use them for a bottle cap staff and have used them in a dip tray workstation too. 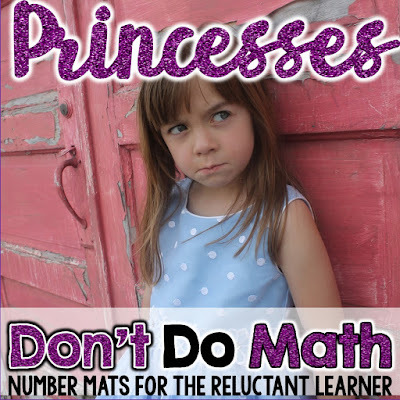 Since I just happened to have a big stash of these, they made the perfect muse for my hands-on number mats. I collected many of the caps myself, but I also enlisted parents to help me as well. It didn't take long before I had more than enough caps for all the projects I would ever need! I put them all in the sink with hot, sudsy water and sloshed them around. (Yes, "sloshed" is the technical term.) I laid them out on a towel to dry and they were ready to go. Here's what they look like in action. These are cleaned bottle caps in a variety of colors. I had a few parents turn in lids from larger bottles and from milk jugs. I've got them stashed somewhere for another project, but for the number mats I really wanted to use just bottle caps. This Ferris wheel set is one of my daughter's favorites. It is second only to the the mermaid set. Each of the sets contains mats for 1-10. I printed off the full color versions, but in the sets that I've posted in my store there are four versions. In addition to the full color version with the little circles to show placement of the bottle caps, there's one with an ink saving background. There are also versions without the circles in full color and with the ink saving version. For the hammer and nail version I painted the tops of some gray bottle caps and added "ones and X's" as my daughter described them. When we worked with this set we used a little plastic hammer to smack them as we counted them. Our favorite bottle caps were spray painted gold. They work great for the sandcastle set and would be awesome for the treasure chest and piggy bank versions I'm working on. We painted the yellow bottle caps to look like corn cobs. These were a little trickier to do! We added the lines with a permanent marker and they look great with the cornstalk set. For the beehive set we decorated a few of the yellow bottle caps to look like bees. As you can see in the picture above, the bottle caps aren't always the same height. 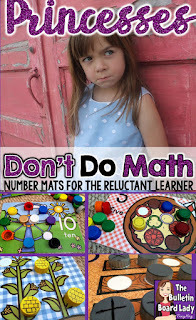 As long as the diameter is the same, they will match up with the circles on the number mats. The fish bowl set would be fun to use with those shiny aquarium rocks too. 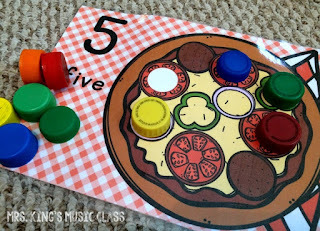 We did use the bottle caps for the pizza set, but we had been using play dough earlier, so we made play dough toppings for our pizza mats too. The bottle caps work regardless of which side they are placed on as scene on the starfish. Actually, I think they may look better upside down with this set. The frog set was great fun! We decorated a few of the caps with little flies. We also used some of the plastic frogs and insect from the party store to count with this one. 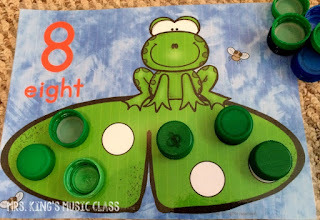 In addition to counting with these number mats, we used #5 for "Five Green and Speckled Frogs". In addition to counting with the mats and arranging them from high to low and vice versa, we've started using them for simple addition problems. I'll lay out the mats for 1 and 5 and ask "How many all together?" and she can add them up and give me an answer. Sometimes inspiration comes out of nowhere. Sometimes it comes from the clearance aisle at Walmart. I was dashing in to pick up a prescription, some cream cheese won tons and the largest bandages I could find (don't ask!). That is when I saw them. Honestly, I didn't even know what they were, but the clearance tag was calling my name. These are cardboard clay holder stands. It turns out that these sturdy little stands hold the clay birds used for shooting practice. They are normally 6-8 bucks. Check them out here. I looked at them and knew exactly what I wanted to do! I would create a tossing game and use it in a workstation. 1. Would fit through the holes with a moderate amount of success even for a bad thrower like me. I tried tennis balls and golf balls. (Right size. Too hard.) I tried some little bouncy balls. (Too bouncy.) I tried a rolled up pair of socks. (That might have been just for fun.) 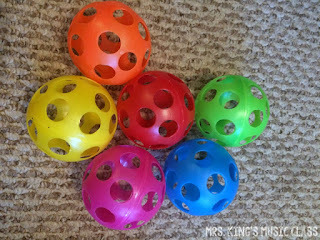 I also tried a few miscellaneous balls I found in the kids' rooms. Nothing was just right. This necessitated a trip to Target, The Dollar Tree, Party City and Hobby Lobby. Okay...don't tell my husband but I went to a couple of extra places just because. What I found were these colorful Wiffle balls at Hobby Lobby. 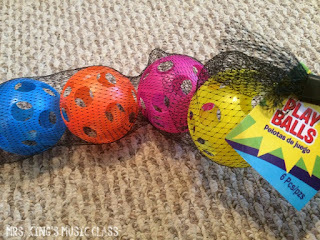 The tag says "Play Balls" and they are made of a light, durable plastic. Perfect. Next, I painted the clay holder stand a lovely shade of purple. 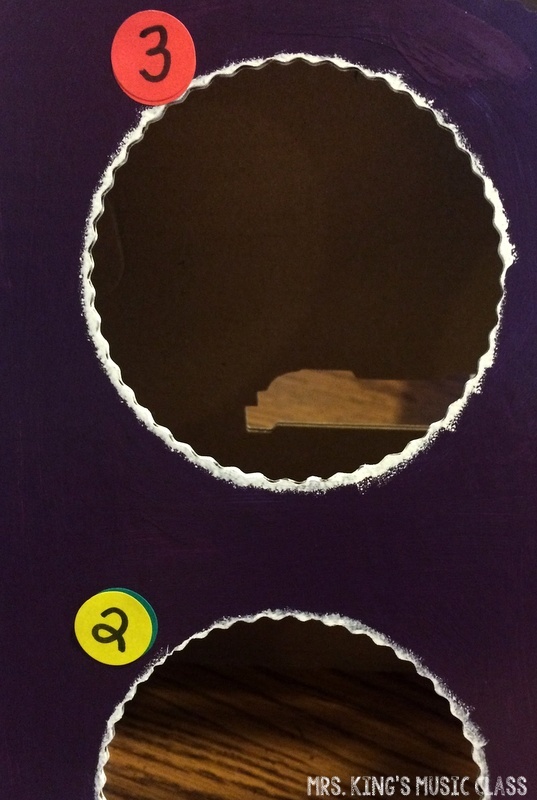 I added the white around the cut-outs because I wanted a little more contrast to help students aim. I had a game in mind. Actually, I've had a game sheet made up for a game that I've used that is similar to this. I tweaked it just a little and you can download that at the end of this post. For this game, I needed to mark each circle with a note or rest value. Wanting to use this with the most grade levels possible, I stuck with quarter note, half note, dotted half note, whole note, barred eighths and a quarter rest. Next, I added little color coding dot stickers with the note and rest values. I chose these little stickers for a couple of reasons. They are inexpensive and easy to remove or replace. Since I could imagine this game working for multiple grade levels and multiple subjects, I wanted to make sure that whatever I used was versatile. I think that with my next one I may upgrade and buy some chalkboard labels to use. To play, students use one score sheet per team. 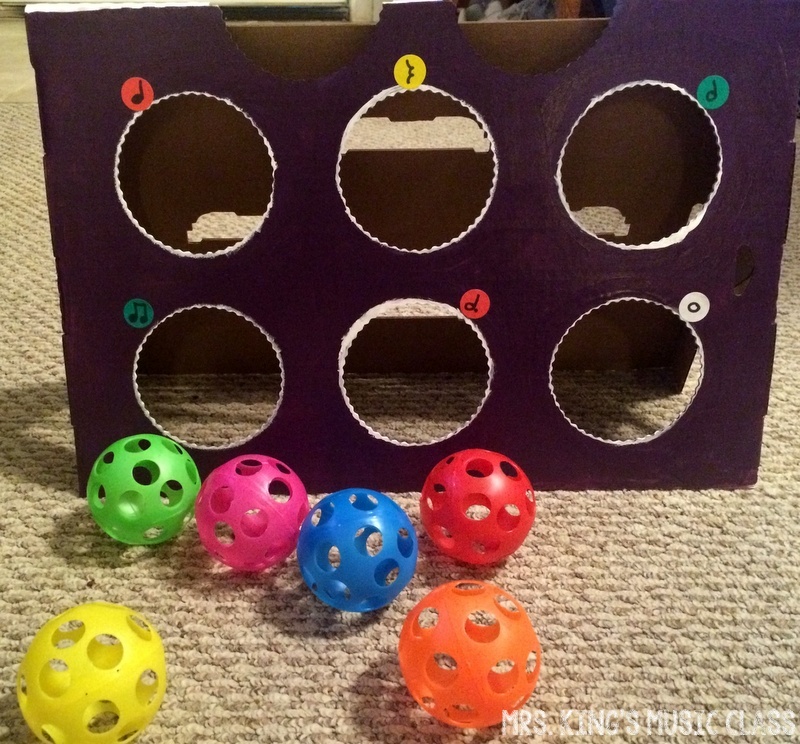 They take turns tossing the balls into the circles that will earn them the most points. They write down the note that they hit and its value on the score sheet. At the end of the game, they tally their scores. The winner is the player that has the most number of points. 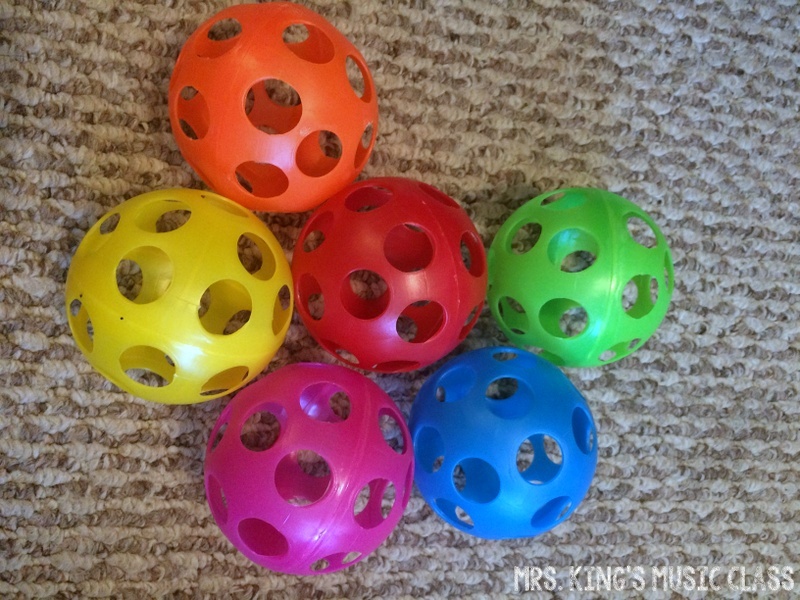 When placing this in a center and giving instructions, I think that it may be necessary to let students toss until they make it or give them at least 3 tries before moving on to the next student. From our experimentation, about three feet away was a good distance. This provided a good amount of success, but wasn't too easy. You may find with older groups that you can get away with putting your tossing line a little farther back. 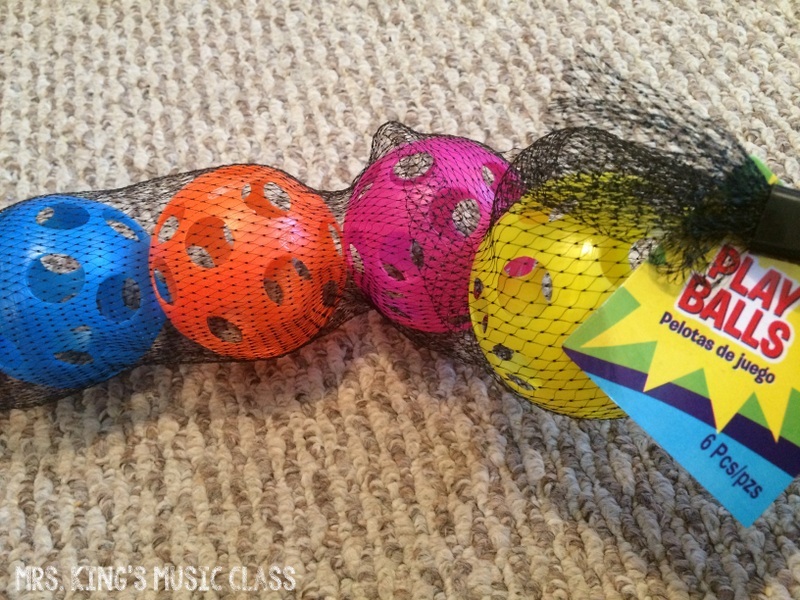 This idea could be used for a variety of subjects and activities. 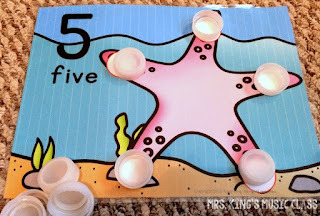 By simply using numbers, this activity could be used for an addition or subtraction workstation. Add the consonants b, c, f, h, p and s and have students toss and write the "-at" word family words. The possibilities are endless. You can grab a free download of the score sheets that will work for this specific game. Included are 4 version. Two of the versions have a key at the bottom to remind students of how many beats each note or rest gets. Two of the versions use the rest as a negative number that takes a point away from their total. Did you like this project? Pin it! I hope you love this project and get much use out of it in your classroom! Introducing Singing Rocks! You may have seen these around the teaching world called "story stones". Essentially these are rocks that you can use to teach storytelling, practice opera singing or explore improvisation. 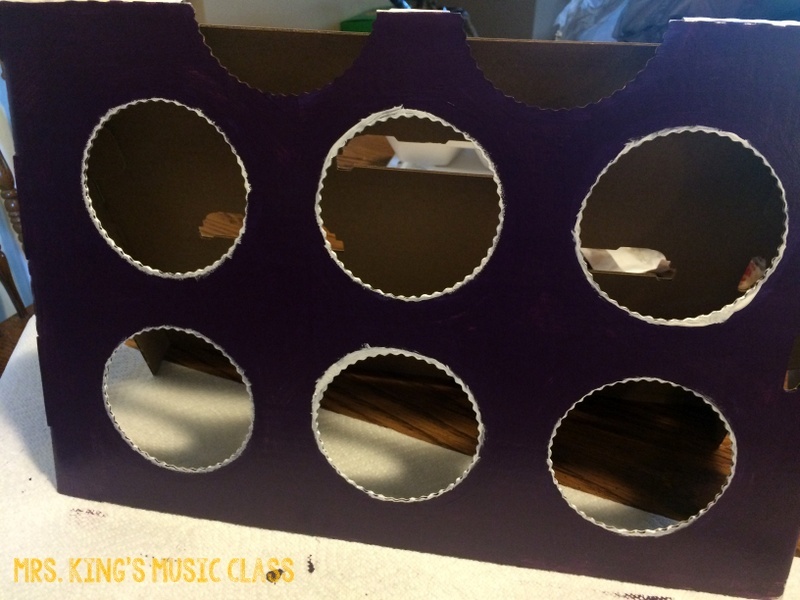 In this post I'll walk you through how to make them even if you have ZERO artistic skills and we'll explore some ways that you can use them in your classroom or at home with your children. This is the collection that my daughter and I made. It contains enough characters, animals, places and icons for many known stories and a limitless number of improvised stories and songs. You'll need some smooth rocks (any color) that are an 1-3 inches big on at least one side. I purchased smooth tiger rocks from the craft section at Wal-Mart. They also had some great river rocks, but at my local store they only came in a very large bag. You could also collect your own rocks from the river or maybe even your own yard. Make sure they are clean and dry. 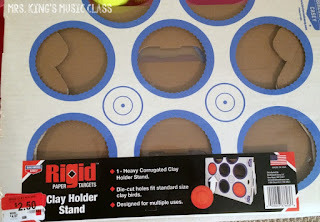 For this project I chose to use Mod Podge. I love Mod Podge almost as much as I love my laminator and you know I LOVE my laminator. Anyway...where was I? Oh! Yeah...Mod Podge. Awesome. Get some. You'll also need a small foam brush or two. If you are not a fan of Mod Podge, you can use Elmer's School Glue and just water it down a little bit. You'll need to allow a bit of extra drying time with the glue. Next, decide what pictures you'd like to have on your rocks. I would love to tell you that I measured each rock and then sized my clipart to fit it perfectly, but...uhm...no. I chose to walk on the wild side and just sized them small and then found a rock that would match them later. 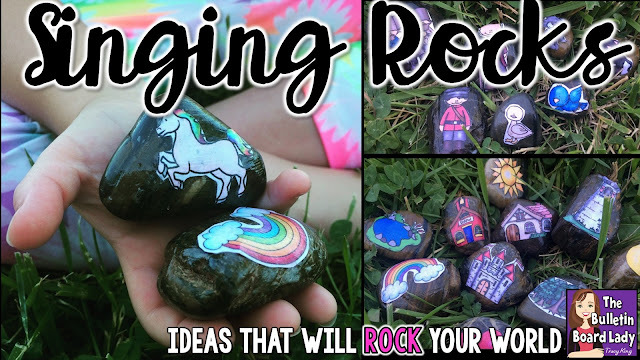 If you are artistic you could use paint pens and/or permanent markers to create your Singing Rocks. Now it's time to get busy! Cut out each of the images. I chose to leave a thin white border on most of them, but you can trim them as close as you have the patience to do so. After you have selected a rock to match your cut out image, liberally apply the Mod Podge. It doesn't have to be perfect. You'll smooth it out later. The rocks are usually not perfectly smooth so some adhesive may pool up here and there a bit. No worries. It will dry clear. Next, lay your character on the rock and smooth out any bubbles or wrinkles with your brush. I used my fingers, but remember? I was totally walking on the wild side. I was also working with a 4 year old and her standards are much lower than professional crafters. 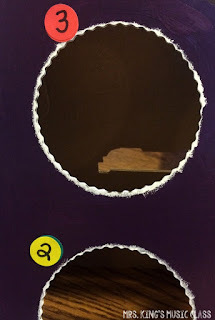 Next, cover the cut out with more Mod Podge or your glue mixture. 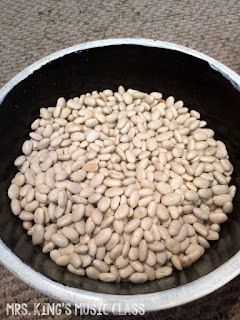 Smooth out any additional bubbles or wrinkles and them set it aside to dry. After it dries, if you notice any edges that stick up or might be easy for a bored child to peel up, add another layer of Mod Podge and let it dry again. My daughter is a singer. She sings constantly. She wakes up singing. She implores us to let her spend the night at grandma's house in song. She sings when she's hungry or bored or happy and she even sings when she's sad. *cue Daniel Tiger's "It's Okay to Feel Sad"* She also loves to make up stories to pass the time in the car or a rainy afternoon. So what do we use these rocks for? OPERA! An opera is just a play that is sung instead of spoken. It is ridiculously fun to make an ordinary story into an opera by singing it! It doesn't have to rhyme. It doesn't have to have a memorable melody (although most kids tend to find one they like). Just sing! With students I use a book like Chalk or Tuba Lessons. These books have no words or very few words. Students sing what they think is happening on each page. I usually sing the story for a few pages and then ask students to sing about what happens next. Even my grumpy 6th graders have loved this activity. With Singing Rocks, the idea is the same. Put the rocks in a bag or box that isn't easy to see into. I've found that an empty tissue box works great for this! Pull out a rock and start singing something about what you see on the rock. Then, the next person pulls out a rock and continues the story by singing about what is on their rock. Once your students have done this activity with you leading it, they can easily use Singing Rocks at a workstation. In my collection, I've included several places that our characters could visit: pond/lake, school, home, a tower, a castle, etc.. I've also included some icons like a moon, sun, heart and rainbow that could be used to represent emotions or actual events in a story. Do you recognize these characters? These are the characters from Peter and the Wolf. I think a set of these rocks in little plastic bags would be so much fun to use when listening to the story of Peter and Wolf. Use them to have students identify the characters that they hear. For practical purposes, I would probably make a set for my classroom for about half of the group and then have them share. 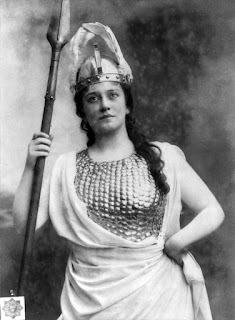 Who is this grand old lady? Well she could be the grandmother from Little Red Riding Hood, or my aunt who came back from Timbuktu in "My Aunt Came Back" or quite possibly the little old lady who swallowed a fly. I know this is going to sound crazy, but instead of singing stories, students could actually just tell stories. I know. Crazy, right? Why talk when you could just sing? Imagine the countless number of adventures that these characters could go on! With a couple of additions, this set could be used for Carnival of the Animals. 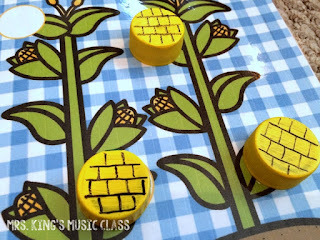 Retell the story of Little Red Riding Hood with these stones. Create a new adventure for this poor princess that has been trapped in a tower all of her life. Explore the mysterious ocean with the Singing Rocks below. So what can you do with Singing Rocks? Improvise a story with the whole class by having one student start and then passing the Singing Rock bag to the next student and so on. Reinforce the idea of opera by having students sing whatever comes to mind when they see the songs. Practice syllable identification or note values by having students chart which pictures have 1, 2 or 3 syllables. 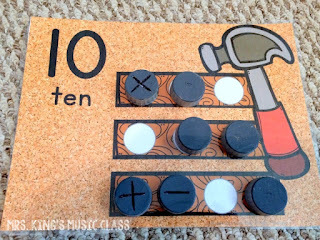 In music class have them chart which rocks match a quarter note, barred eighths or another pattern. 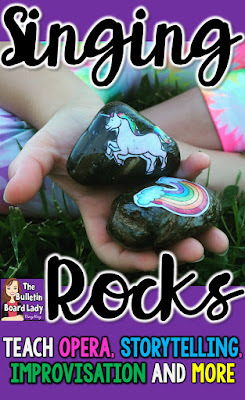 Tell a story and then have your kids write their story down using the Singing Rocks to guide them. If you are working with a pre-reader (like my daughter) be their scribe and write it down for them. Afterwards, have them illustrate their story. 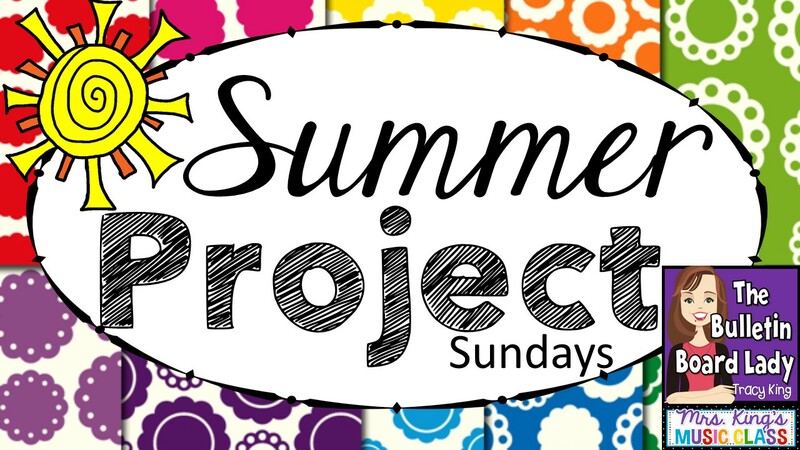 What kind of projects are you working on this summer? Link them up below! 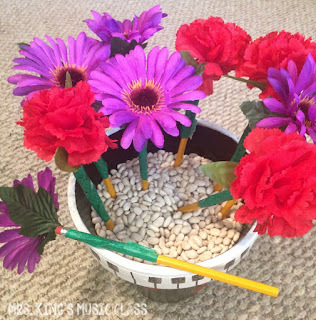 Last year I spent my summer posting crafty projects that you may enjoy for your classroom. You can see those posts HERE. Join me this summer! 1. 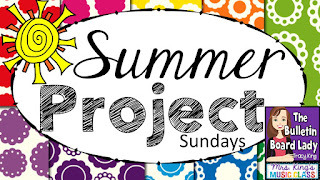 Grab the Summer Project Sundays picture above. 2. Link to this blog post.